Cooking for others can be difficult when they don't eat by the same guidelines that you do or don't have the same food preferences. Sometimes, it seems as if the only choice you have is to serve roasted chicken and vegetables or salads yet again. While this might seem the case, it isn't true at all. 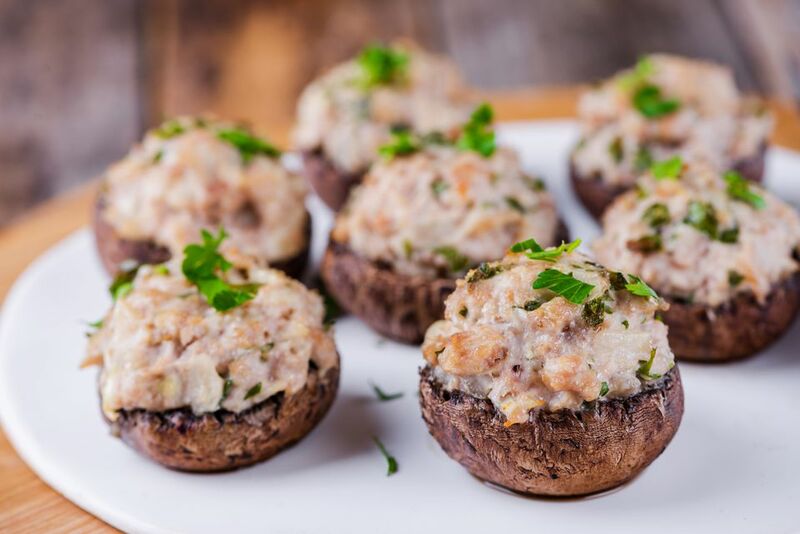 Take these stuffed mushrooms, for example. They're filled with tender ground turkey and mixed with water chestnuts and leafy fresh parsley. The filling is combined by homemade paleo mayo instead of a rich, heavy sauce. With flavors so expertly blended you won't even notice there isn't melted swiss cheese on top. There's also the surprise of fennel with make you appreciate all the spices you have been neglecting in your cooking. These are a nice addition to main courses as an extra side or served as paleo hors d'oeuvres. However, they can be made into an open face turkey "sloppy joe" by substituting 2 to 3 large portabella mushrooms and placing the filling over them. No matter which way you decide to get this in your belly, you'll be glad that you did. To start, lay the mushrooms out on a rimmed baking dish or in a large casserole dish. As the oven preheats, combined all of the stuffing ingredients in medium mixing bowl and knead until all ingredients are well incorporated into ground turkey. Using a spoon, scoop equal parts mixture into each cremini mushroom until all of the mixture is used. Once the oven is preheated, put the stuffed mushrooms in and allow to cook for 35 minutes. After 35 minutes, check to make sure turkey is cooked completely. Mushrooms will keep for a day or two at most. Must be kept in an airtight container inside the refrigerator. To reheat, place in a baking dish and reheat at 350 degree F for approximately 10 minutes or until warm or reheat in microwave safe dish on high for 2 minutes or until warm. On day two and not sure what to do with these stuffed mushrooms? Chop the entire mushroom and flling up and throw them in a skillet with scrambled eggs and then top with salsa for a spur-of-the-moment breakfast (perhaps like this Sunrise Scramble).